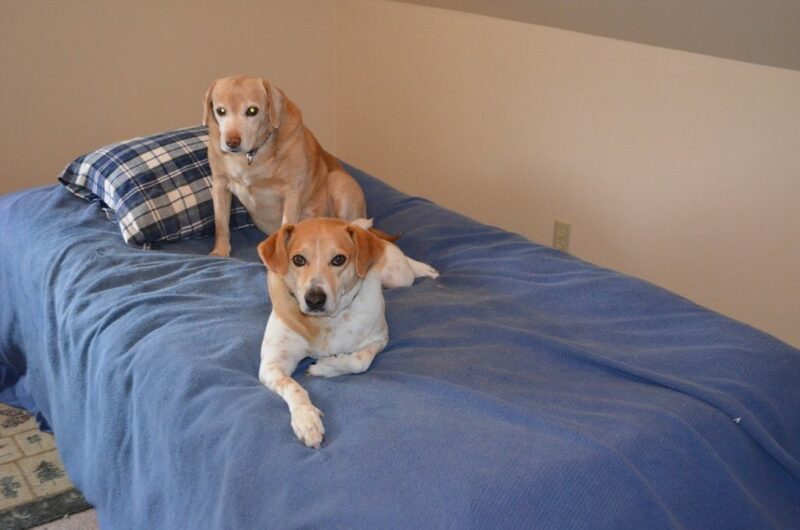 That’s three-legged Tanner with Darla on her bed in her room upstairs. We’ve started calling them “Dar-Tan,” as in a single unit. You see, Tanner is a very smart boy, and he figured out quite a while ago that Darla is not only the queen bee of the place, but my?favorite girl who can bend me’to her will at any time for any reason. Alayne describes this relationship as “ridiculous,” which I freely admit it is. Darla knows how to manipulate me, I know what she’s doing, and I still can’t resist. Anyway, back to Tanner. So he figured this out, and decided that if he just started doing everything Darla did, he too might end up in the top spot. Or at least, sharing the top spot with you-know-who. Early on he became a Daddy’s boy, running to me first for attention and a kiss, responding to me faster than he’d respond to Alayne, etc. You get the idea. When I’m sitting in my chair in the corner reading, he walks over, stares me right in the eye, and won’t leave until I put’the book or laptop down and kiss him on the nose. Sometimes it takes up to four kisses on the nose before he’s satisfied and heads off. If I don’t accommodate him with a kiss, he will literally just stand there and stare at me until I do. He learned that by watching Darla do the same thing, though most often she’s doing it from the adjacent chair. She prefers reclining while giving me the “stare-down.” That way I have to get up out of my chair and go over to her to give her a kiss and love her up. (I said she’s manipulative.) Tanner at least comes to me. For now. If I am making over Darla, Tanner rushes in, forces his way between us, and insists on getting whatever she’s getting. He will not let me love her up in his sight without sharing the moment. Thus I am usually loving up both dogs at the same time, one under each arm. Recently?he started getting on Darla’s recliner in the living room. That also sent a message. Then, he began following Darla?up the stairs to the second floor, where other dogs are not permitted? (because some of our dogs like to pee on the?carpet that’s upstairs). Yes, I?allowed him to stay. It was as?if this was the last thing he needed to do’to establish, once and for all, that he?was?Darla’s equal, entitled to all the rights and privileges she enjoys. Now he often hops onto her?bed when she’s on it. A prince to go with the princess, if you will. I think you can tell from the look on Darla’s face in that photo that she isn’t too sure she really needed a prince. Oh, well. There’s the royal?couple. Programming?Note: Because of the Memorial Day holiday next Monday, we won’t be posting on the blog next week and will resume on Monday, June 6. Obviously, like Alexandre Dumas, you have a Dar-Tan yen. That’s so funny. I really wonder what Darla is thinking as he follows her around like that. What a handsome royal couple! And what a smart boy Tanner is. He has managed to work his way right to the top through careful study and planning. 🙂 I love watching dogs learning from each other, even when they are picking up bad habits rather than cute ones. Tanner is extra adorable and certainly deserves lots of kisses. I love the prince and princess. They make good company. Hmm, Steve, I remember 15 years ago when Rolling Dog Ranch was established, you had rules for the dogs, keeping the order and all. Seems you’ve gone a little soft in recent years. But, as you say, Darla has her secret ways of making you her personal attendant, and setting all the rules herself. She’s a smart one! Dar-Tan!!! What a great royal couple!! Tanner is one smart guy!!! He obviously learned from the best how to get the royal treatment. He looks very proud. Darla looks not too sure of this!!! Your post is ridiculously cute! Tanner has always had my heart!